Jamaica‘s Emancipation Day (August 1) is not far away. With our fiftieth anniversary of Independence we are looking forward – but we have also looked back at our history, and the history we share with other nations. One of those experiences, which can never be forgotten, is slavery. In Jamaica, we associate West Africa with the slave trade; but it was flourishing for centuries in East Africa, also. The slave market in Zanzibar was closed in 1873, when Sultan Bargash signed an edict making slavery illegal. Some fifty years earlier, the Omani Arabs (who had controlled Zanzibar since 1698) signed a similar document, but the practice continued, with slaves being transported by Arab traders from Zanzibar to mainland Africa, where they were used to transport ivory. 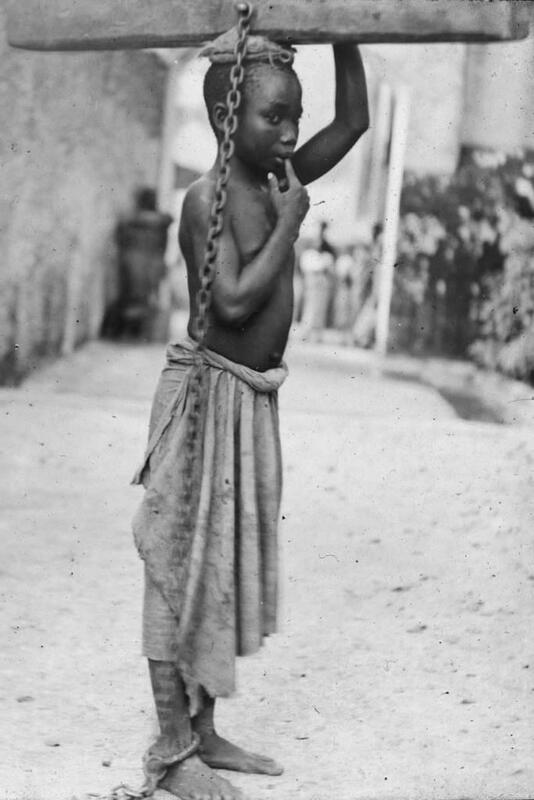 A slave at Zanzibar Slave Market in the late nineteenth century. They landed at a place called Bagamoyo, on the coast of modern-day Tanzania and the country’s oldest town. The name Bagamoyo means “Lay Down Your Heart” in Swahili. The town has beautiful white beaches, thirteenth-century Arab ruins and fishing in Arab dhows, and is also home to an Institute of Art & Culture which stages an annual arts festival. Bagamoyo was recently designated as Tanzania’s seventh World Heritage Site. A beach resort at Bagamoyo, the town where hundreds of slaves once walked in chains through the streets. I came across this short but haunting piece in “The East African” online, and thought I would share it with you. The author is Edgar R. Batte. Slavery and the slave trade are things I was taught in history class. At the old slave market, in Stone Town– Zanzibar, I came face-to-face with this history, in bricks and concrete, a legacy that reminds me of the painful experiences our ancestors suffered. Ironically, a church stands side by side with the slave chambers. In I go and I am greeted by an appalling sight — a ditch in which four slaves stand in solid cement, clasped by neck collars and an iron rod riveted at both ends across the throat. I learn from my guide that this is how slaves were sold to potential buyers, at this spot which retains the name of the old slave market. When a slave fitted the specifications of what a buyer was looking for, they would buy and own them. This monument of chained slaves was constructed in 1998 using the original 19th century chains. Through the church you will be led to the two slave chambers, which were classified according to gender, the large one for women and children and the smaller one for men. The walls remain grimy and ancient. Chains lie on the benches for the slaves. On a noticeboard in the compound is a placard: “During the slave trade, these two underground rooms were used to keep slaves, before being taken to the market for auctioning. Originally there were 15 chambers accessible but only two are accessible today. A small hut was on top and there was a big hole used as an entrance to the slave chambers. Many slaves died of suffocation and starvation,” the placard reads. 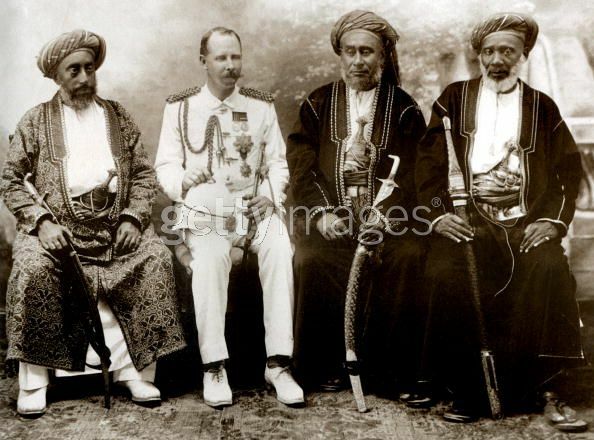 British colonial official with Arab rulers in Zanzibar; on the far right is Tippu Tip, the most infamous Arab slave and ivory trader, who died in 1905. The larger one, according to my guide, would take in up to 80 slaves while the smaller one took in about 50. There are three windows that let in light, two having been built for tourists, but originally there was only one window serving the slave chambers. My guide tells me that slave masters whipped slaves to find out who could stand pain. If a slave wept, he would attract a lower price because of exhibiting cowardice. Men and boys had their skins oiled while women were dressed in nice clothes, sometimes even adorned with necklaces and bracelets. A large tree was used as a whipping post to display the strength of the slaves. Those who did not cry fetched a higher price. Some of these trees still stand in the middle of the compound. The entrance fee to the old slave market is $3. Just adjacent to this historical site stands St Monica’s guesthouse. 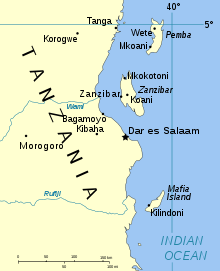 Zanzibar is the largest of the Spice Islands, off the coast of Tanzania in East Africa. Nice post. 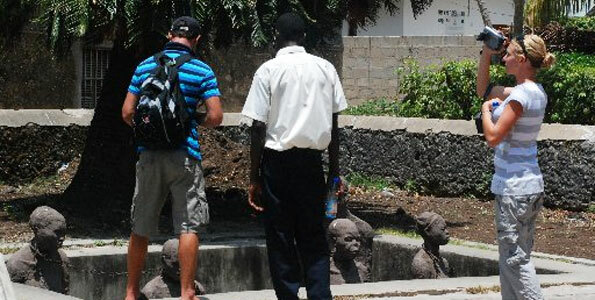 I reside in Dar about two hours drive from bagamoyo the centre of slave trade in Tanzania. Keep it up. Kaka Caleb. Wow, thank you so much for connecting. I would really love to visit the area one day, just to really see and absorb some of what happened there, although it might be very difficult in many ways. I really appreciate your comment. I must restart my “African Postman” series and if you can suggest interesting and little-known topics I would be more than happy to explore and write about them. Wishing you all the best. Many cultures outside of the U.Us.deny that slavery was and remains a part of their history. The deny, sometimes vehemently, that they are descendants of the slave trade which we have discovered was global. What we who accept our true history, and those who deny their true history fail to realize is that together we can become a brutally empowering force with which to be reckoned in a world that insists upon perpetuating wrongs and blatant injustices against people of color around the globe. Pastor Gladys. Dear Pastor Gladys: I am sorry that I am only just seeing your comment, so forgive me for the very late reply. Here in Jamaica we are currently having a very heated debate over the responsibility for slavery. It is very painful for all of us, whatever our racial origins are, and emotions are running high after the UK Prime Minister’s visit last week. Wherever we are in the world, we must accept our history for what it is. Otherwise we can never progress. Thank you so much for your kind thoughts. Thank you for this history. I hope to refer my middle son here when we start homeschool history in the next weeks. We will be studying (again) about slavery, and this is something I have not come across before. Thank you for this very touching post. Bless the souls that were tormented so. Thank you for your comments, my dear Sam. In fact, it was not something I knew much about until I starting doing some research. In Jamaica we hear a great deal about slavery from western Africa, which is where most of our ancestors come from; but not so much about east Africa. As I read, I found it very touching too – the photographs of the little town in Tanzania where the slaves landed were so evocative. It must be full of the spirits of those people. I am so glad that your son will use this post in his studies – perhaps for further exploration. That is very gratifying to me! Thanks. Depressingly, slavery has been around since the dawn of time and is still with us. I am afraid so, Jack. Yes, it is just beginning to be told – as I realized, in the Caribbean we put slavery in the West African context. Even there, there is more to be said. I meant to add this link: http://www.arabslavetrade.com/ – which has a very good quote from Haile Selassie I on its home page – it has a Pan-Africanist approach. Thank you for your comment, Barbara! Painful to read, man’s inhumanity to man seems to know no bounds.